I love the lamps. However when they arrived one of the lampshades was dented . You would have a happy customer, if you sent me a new lampshade ! 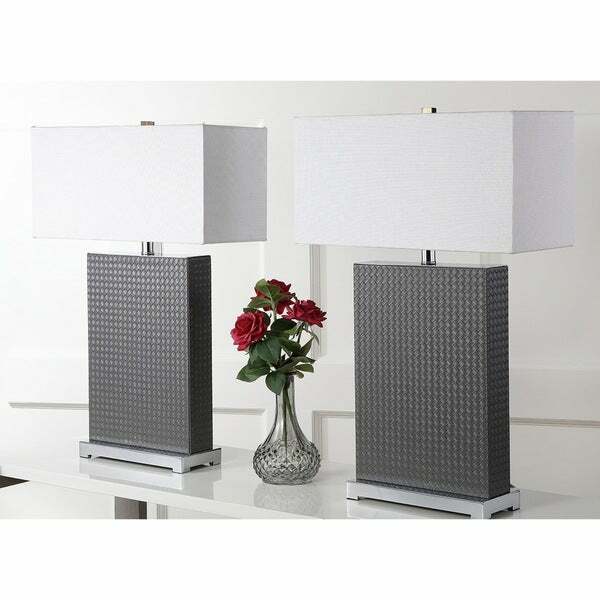 Bring a contemporary look to your home or office with this set of two table lamps, featuring a grey color scheme and a geometric texture. This set of table lamps operates with compact fluorescent bulbs to bring a soft glow to your work or play area. 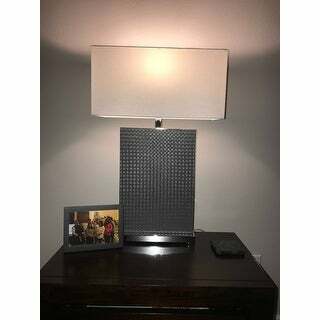 When I ordered these lamps I thought from the pics these lamps were black...Missed the part that they're Grey (Dark Charcoal grey)...They are cute n stylish...Will keep them n maybe paint them black...Great price for 2! The lamps are made of quality material and solid construction. The light bulb was even included. Very stylish and modern design complimented both my living room and bedroom. Well worth the purchase. These lamps were more than expected! Large size, great quality and look amazing in our bedroom. The quality seemed great as well. Also came with the light bulbs which was nice. They look very modern and high end. Highly recommend for the price! These are big & bold and look expensive. I only gave 4 stars because the shades had a few minor dings in them. I absolutely love these lamps. I bought them fot my son as he loves a modern and sleek look. These are also a great value as a set. Love the grey color! They were really nice. I had to return them cause they were too wide on my end tables. 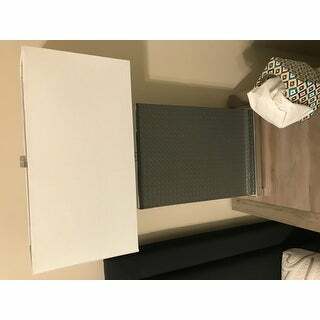 Such a value- used for vacation home at guest room. Looks like hotel! It came with light bulbs and arrived so fast! I just purchase a new house and needed some additional lighting. These are my absolute favorite lamps. They are very contemporary and give my living room a fresh and sleek look. You will not regret purchasing. The lamps are so gorgeous! The grey body added color and matched the curtains I have in my room. Im so happy with this purchased! Thank you! I am very pleased with this purchase! These lamps are well-made, attractive and I think they look expensive. The picture color is spot on. I have received several compliments on them because they match my family room decor perfectly. I just love the Safavieh design collection. Delivery was not expected to be until the 12th but to my welcomed surprise it came two days early. Talk about excitement. I immediately opened the box and began unpacking. When I saw how big the lamp was I was a little concerned that it wouldn’t look right. However, they are a perfect addition to my decor. And I mean perfect. Thanks Overstock. These lamps are absolutely gorgeous! They look so much better in person! 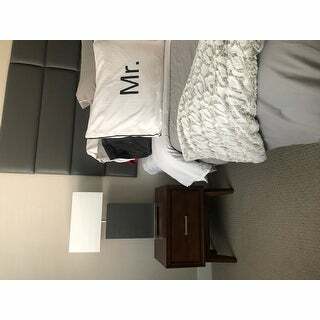 The lamps was a perfect addition for the bedroom and it goes along with the bed very well. We were hoping that it would. We also bould some just like it for the other bedroom. These are absolutely all that, attractive and comes with everything even the bulbs. "What are the dimensions of the base specifically?" 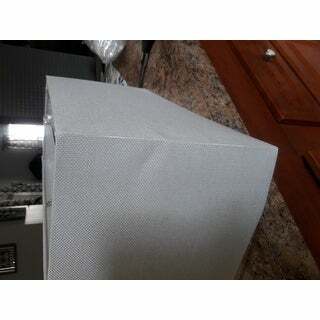 The lamp body dimensions are 11.25 X 4.75 X 16.75. The bottom base dimensions are 11.25 X 4.75 X 1.25. "What is the width of the base and also width of the shade?" 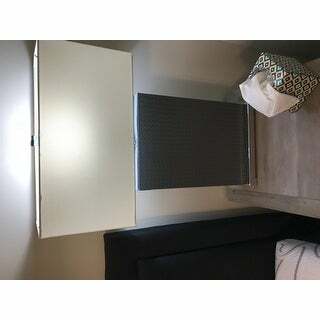 The bottom base dimensions are 11.25 X 4.75 X 1.25, the lamp body dimensions are 11 X 2.75 X 15.5, and the width of the shade is 8"". "Can you use a 3-way lightbulb in this lamp?" It does not use a 3 way bulb. Very stylish, i love it!!! I like the style and I believe the lamps are going to look very nice in my family room. "Are these lamps more or less a Charcoal Grey? I already ordered them not realizing they're grey. Are these lamps available in black?" 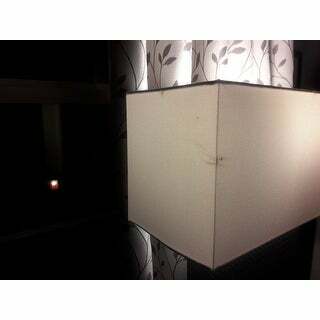 These lamps are a dark charcoal grey, in my opinion. "The picture makes the woven but look black, but the description states gray? I am actually looking for black? Please advice." "How dark is the gray? "